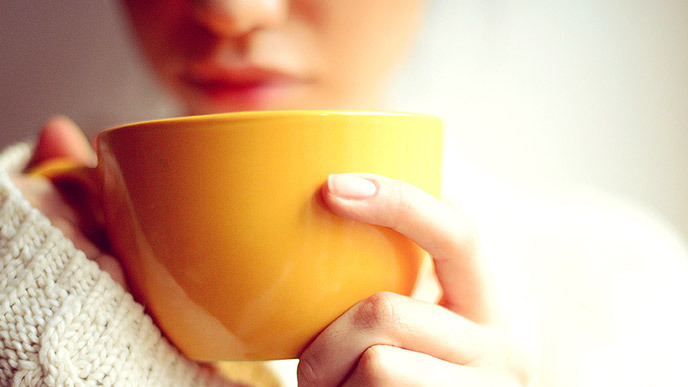 Surviving the winter blues the Ayurvedic way. In Ayurveda, the fall and winter seasons are predominated by Vata energy. This means we see Vata qualities in our climate (cold, dry); as we all absorb the atmosphere of our surroundings, we also tend to show these qualities in ourselves. Vata, one of the three primary energies in the Ayurvedic classification system, embodies death, release, movement, coldness, dryness, emptiness, lightness, and degeneration. You can sense the energy of Vata in dry forests with empty trees, in the drying cold of the ever-moving wind, in the lightness of dried leaves and soil, and perhaps, in the emptiness in our hearts if we are longing for loved ones. Vata season, along with being a time of creativity, travel, and social engagements, is also a period of extremes and depletion. This is why we see so many people on emotional roller coasters this time of year (No, it’s not just your family!). The same Vata energy that inspires those new, radical changes can land us in a place of low energetic resources and degeneration. In Ayurveda, we bring in opposing qualities in order to balance whichever energy is in excess. To counter Vata’s depletion, we welcome warm, moist, nourishing, grounding, still, heavy, constant, regular, and rhythmic characteristics. This is why ancient cultures from around the globe eat heavier, spicier, and more nourishing foods this time of year (like mulled cider and hearty stews), why animals hibernate, why we are socially accustomed to work less and spend more time with family, and why we have practices that celebrate abundance—consider the holiday season a Vata panacea. It’s also dark for a greater part of the day and we are meant to rest for a greater part of the day. Increasing stillness and being homebodies grounds us. This winter, try setting an intention to slow down. Make decisions that reduce movement and increase intimacy and depth of relationships. Try to travel less and prioritize family time and activities like baking, crafting, and entertaining at home. Do things that feel rejuvenating: Vata season is a great time to indulge in self-care, yoga, meditation, warm baths, and eating home-cooked foods. To physically balance Vata, try a body oil massage, Vata-reducing diet (eat more warm, moist, cooked, spiced foods), follow a regular schedule, and make sure to get plenty of rest and hydration, while avoiding depleting interactions and circumstances. When faced with stress, take a cue from Disney’s Elsa (the ultimate ice queen) and let it go.